Popular throughout Asia, Korean singles and doubles players often make the finals in regional and world championships.At almost any outdoor recreation park, you can find several badminton nets setup and many enthusiasts hitting a birdie back and forth. The country has a number of professional baseball teams, most owned by the major business conglomerates. 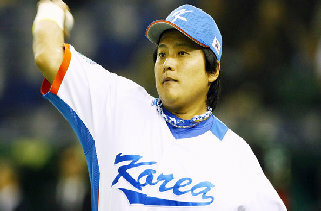 At the end of each year's season, the Korean World Series keep fans glued to the TV, rooting for their favorite team. Teams have recruited several foreign players. For many years, the bicycle was the main mode of transportation for most Koreans. With the prosperity of the 1980s, the number of automobiles far exceeded the ability of the roads to handle them. Trying to cycle in any of Korea's metropolitan areas can be suicidal at times. Fortunately, the government began to build bike lane trails, especially along the riverside parks bordering the Han River in Seoul. Mountain biking has also been gaining in popularity in recent years.The Korean Mountain Biking Association can be reached at (02) 967-9287.The Olympic Velodrome has professional track racing during the summer months. Koreans are made about Soccer. Korea's passion for soccer fueled its ambitions to hold the 2002 World Cup. Instead of being the outright host, Korea co-hosted the event with Japan. Korea's poor showing in the 1998 World cup did little to dampen the expectations for 2002. On evenings and weekends, you can find many organised or pick up games at parks and playgrounds.